This is Faith Delmonte’s third year at Divine Wisdom Catholic Academy. Faith grew up in Douglaston and was baptized and confirmed in the St. Anastasia parish. She has also competed on St. Anastasia sports teams. She attended public school until pioneering the way for females at Archbishop Molloy High School as only the second class of girls admitted when it turned co-ed. In college she studied biology, chemistry, and sports science at Smith College. After college she began a career in sports administration as the Program Director for Special Olympics New York in Nassau and Suffolk Counties. After several years as Program Director she decided it was time to get a masters degree and make a career change. Always having thought about going into teaching, Faith applied and received a federal grant to go back to school and get her masters in adolescent education. Since, she has worked in NYC public schools (Bayside HS, Queens School of Inquiry) and charter schools (Uncommon). After taking a year off to be a first time mom, Faith found her way to Divine Wisdom Catholic Academy. 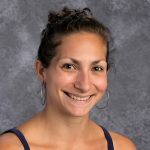 Aside from being a mom and teacher, she continues to be involved with Special Olympics as the New York State Sport Director for Swimming and is an avid runner and swimmer who, in the summer months trains for triathlons. Faith is very excited to be a part of the Divine Wisdom Catholic Academy community again this year and looks forward to all that is yet to come!